Fig. 3. pSYN-RFP reporter system in vitro and in vivo. (A) Co-immunostaining of RFP and TUJ1, and of RFP and SYNAPSIN1 at days 0, 1, and 14, indicating their overlap in the TUJ1+ and SYNAPSIN1+ neurons. (B) Proportions of positive cells (TUJ1 or RFP) counted on days 1 and 14 of differentiation. (C) Identification of striatum tissue on days 2 and 7 post-transplantation. 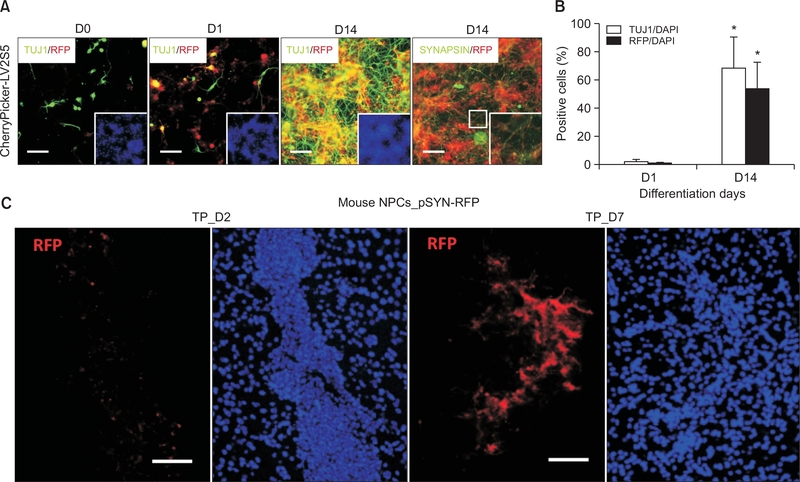 Similar to in vitro findings, in vivo transplanted NPCs did not express RFP at the early stage of differentiation; however, red-colored mature neuronal morphology was observed at day 7 of differentiation. Error bars, SE. *p<0.05. Scale bar, 50 μm.